COTSBot is a robot designed to terminate Crown of Thorns starfish (COTS); it stalks the reefs, protecting them from starfish that would otherwise destroy reef coral utterly. 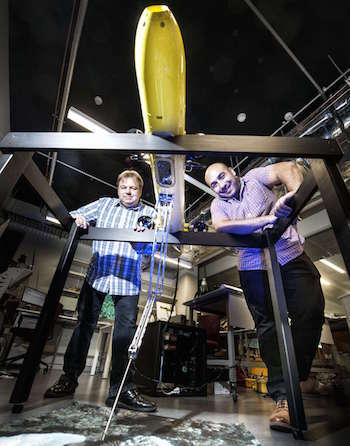 Matthew Dunbabin and Feras Dayoub with COTSbot, the starfish-killing robot they invented. Without any direction from humans, the robot sees its target and zeroes in. It administers a lethal injection before its victim can flee, then seeks out the next hit. It sounds like the plot of a Terminator movie, but this robot is far from fiction. Meet COTSbot, a robot designed to identify and systematically eliminate Crown of Thorns Starfish (COTS) from coral reefs. "Human divers are doing an incredible job of eradicating this starfish from targeted sites but there just aren't enough divers to cover all the COTS hotspots across the Great Barrier Reef," Matt Dunbabin, the creator of COTSbot said in a statement. "The COTSbot becomes a real force multiplier for the eradication process the more of them you deploy -- imagine how much ground the programs could cover with a fleet of 10 or 100 COTSbots at their disposal, robots that can work day and night and in any weather condition." Dubbabin came up with the idea a decade ago, and started working on a project, but at that time, the only way to kill COTS was to either remove them from the reef or inject them 20 times with a poison that would kill the starfish, but not the rest of the delicate ecosystem. Then, researchers found a way to kill COTS with a single shot. The weapon of choice is a dose of bile (digestive liquid), which kills the starfish, but not other animals in the area. Countless wars had taken more from men than science had given them. X-120 and his kind were the culmination of this primal killer instinct. He lumbered forward. A few birds were stirring. Suddenly, almost at his feet, a rabbit darted from the bushes. X-120's long jointed arms swung swiftly. The tiny animal lay crushed upon the ground. Instinctively he stamped upon it, leaving only a bloody trace upon the new grass.